Ilya Kovalchuk respectfully stands by the old adage that money can’t buy happiness. Atlanta’s first overall pick in 2001 has gone on record saying he enjoys life in the city, his family loves it and there’s a strong relationship with everyone involved in the Thrashers organization. With the Russian’s contract set to expire in the summer of 2010, Kovalchuk would like to re-sign with the club. But he wants to see progress; a playoff berth in the upcoming season most likely. While Marian Hossa and Dany Heatley pushed themselves to be traded from the team, Kovalchuk has shown his loyalty by looking for a reason to stay. General Manager Don Waddell is doing everything in his power to make that happen. And he’s right to try. Kovalchuk’s devotion shows that he cares for the team and its fans. He’s not injury prone like Marian Gaborik and he sure isn’t selfish like Heatley. A player like this doesn’t come around very often, which Waddell knows. As the season previews begin to pour out in the upcoming weeks about who will be a playoff contender, my eyes will be on the wild card picks. Reading the same old list of favorites like the Red Wings, Penguins and Bruins doesn’t interest me. The bold predictions regarding which teams can surprise to unexpectedly make a postseason return is what grabs my attention. By publishing this article, I’m predicting that the Atlanta Thrashers will reach the playoffs in 2010 giving Kovalchuk an incentive to stay put. Obviously I have my reasons. 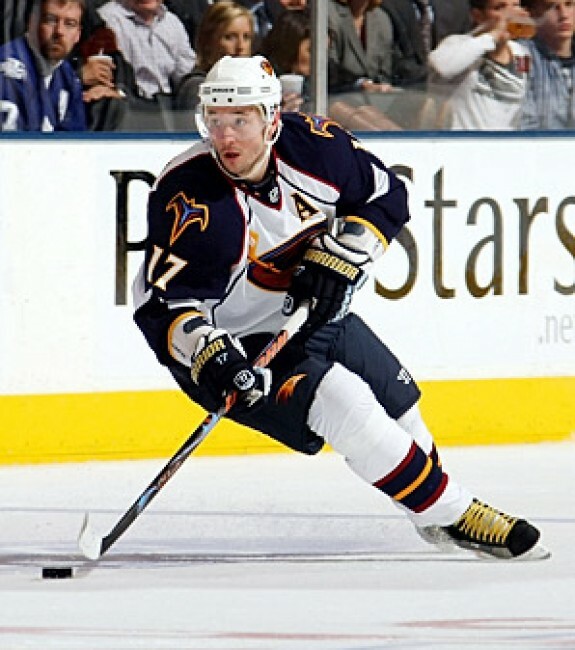 Mentioning the Atlanta Thrashers in the same boat as the playoffs requires Kovalchuk’s very best. Why not see it in a contract year? Talks will undoubtedly surround the Russian throughout the season, a matter that can be a major distraction. But Kovalchuk is far too skilled and determined to be fazed by rumor talks. He has never fired in fewer than 29 goals or hit less than 51 points which were his rookie numbers in 65 games. A powerplay specialist, the 26-year-old has a one-timer capable of putting goaltenders at his mercy, speed that defenders don’t want to tackle single-handedly and he’s begun using his line mates to a greater degree. Numbers like his make it difficult to believe that the prime of his career is about to commence. What has eluded him thus far is the 100-point plateau, something Kovalchuk could have accomplished multiple times on a better squad. This year is a good bet for that to happen. Atlanta scored 257 goals in 2008/2009, fifth best in the Eastern Conference and 79 of them came from the trio of Vyacheslav Kozlov, Todd White and Bryan Little (just over 30 per cent of the total). Here’s a line that has scary written all over it and a fun nickname to remember. While Little is the scorer, Kozlov and White provide the playmaking added with exceptional scoring of their own. Interesting Number: These three and Kovalchuk each produced 12 powerplay goals last season to lead the team. They can all score, dish out the puck and contribute heavily on the man-advantage. Concerns have been have been brought up in relation to Kozlov’s age and whether or not White can repeat within range of his previous career year. Their stats may see a slight drop due to Atlanta’s recent acquisitions and the possibility that this group will have a more balanced attack. However, don’t confuse a minor slip with a disappearance. Rich Peverley was sitting on nine points when the Thrashers picked him up off waivers from the Nashville Predators in early January. Peverley averaged nearly a point per game (13 goals, 22 assists in 39 games) with Atlanta, added an impressive plus-16 rating to lead the team and scored one less game-winner than Kovalchuk’s six. What a steal he could turn out to be. Colby Armstrong has it in him to be a natural 20-goal scorer. I guess he doesn’t need Sidney Crosby to beat a goaltender. Marty Reasoner should chip in with 15 or so goals as a depth player. Hope lies on Evander Kane making the team out of training camp adding a power forward with tremendous scoring prowess. First-round pick Angelo Esposito will get his look-in eventually too. Plug those names with guys like Kovalchuk, Kozlov, Little, White and you begin realizing plenty of available offense. And we haven’t even gotten to the defense yet or the off-season acquisitions. As I was saying the defensemen will have their green lights to jump into the play. Tobias Enstrom, Ron Hainsey, Pavel Kubina and Zach Bogosian give Waddell a solid top four. While 30 points apiece is a reasonable minimum expectation for the members of this tandem, Bogosian is the hidden jewel. The 19-year-old played 47 games following recovery from a knee injury and could have been in the Calder Trophy fold if a full year was granted. Bogosian really began to peak towards the end with 11 of his 19 points coming in the final 16 games. Give him 82 games, there’s no telling how far the New York native can go. Then, two rather unfamiliar names remain in Boris Valabik and Nathan Oystrick. Valabik is the defensive defenseman while Oystrick keeps his game simple and doesn’t get cute ideas. Anssi Salmela waits in the wings as does Noah Welch, both of whom possess offensive prowess of their own. All of Atlanta’s scoring capabilities will be worthless if Kari Lehtonen can’t be healthy or consistent. Last year he was neither thus creating for himself an embarrassing nickname, Let-Them-In. The Finn’s goals-against average has usually circulated in the high twos, low threes. Slamming him for that is unreasonable considering Atlanta’s defensive woes in the past. Lehtonen’s save percentage has been above .910 for three consecutive years. An enigma far too often, he is at a high level of goal keeping when everything is in place for his talent and groin. 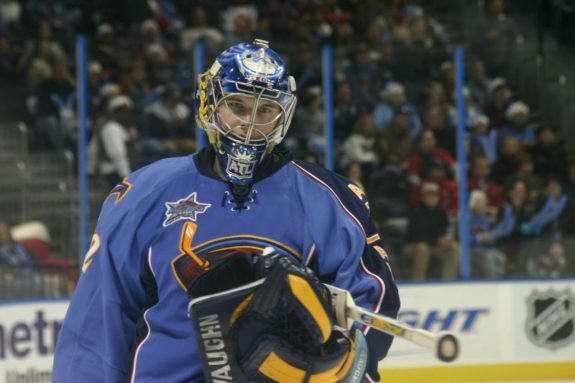 Even though he crashed and burned during his only playoff appearance, the Thrashers qualified largely because of his efforts. I may be taking a large gamble here, but I predict a thorough response from Lehtonen in the upcoming season. Were this a game of poker and Kari’s status resembled my cards, I’d likely be holding deuce-seven unsuited. Terrible odds have even won the odd pot though. Waddell brought Nik Antropov over from New York personally as a request from Kovalchuk. Friends off the ice, the two saw some time together as KHL representatives in 2004/2005. Antropov carries plenty of positives: size, reach, patience, poise, vision and the aptitude to play all three forward positions. Lackluster shifts along with a desire for more physicality are problems. But the largest issue is speed. Assuming he lines up with Kovalchuk, the quickness differential will present itself. Kovalchuk is explosive when he takes off whereas Antropov seems to float around the ice. Mikhail Grabovski’s dashes made it difficult for him to keep up in Toronto. Other than that, these two could compliment each other mightily. Ingenuity normally requires protection. Valabik will certainly receive extra ice time in Garnett Exelby’s absence playing a similar rough style. Despite his skating inefficiencies, Valabik is now one of the keys responsible for protecting teammates. Armstrong will gut it out in the corners and Bogosian is no walk-over himself. Eric Boulton and Chris Thorburn are going to handle the majority of Atlanta’s fighting sequences. Already fearless, the two have recently worked with a boxing trainer for training purposes prior to camp and more importantly, bettering their fists. Working out to that extent shows how serious these enforcers take their job title. Take a stab at one of the Thrashers stars if you must, but do so at your own risk. Last season’s 11th ranked powerplay at 19.3 per cent is sure to see a top 10 conversion rate. White and Kozlov will operate down low, Little will seek an open area somewhere at center and the tandem of Kovalchuk and Kubina offers two cannon shots from the point. Just a possibility for the first unit, the second has options-galore. Antropov, Peverley, Kane, Armstrong are worthy nominees while Bogosian, Enstrom and Hainsey have their powerplay knowledge. Sort the lines as you’d wish. The combinations offered are endless and Atlanta will carry not one, but two significant powerplay units. Penalty-killing is what hurt this team extensively at 76 per cent, worsened only by the Toronto Maple Leafs. Goaltenders have to be the best penalty killer naturally. While Lehtonen can be that brilliant, Johan Hedberg and Ondrej Pavelec have to hold the fort when he’s unable to. Reasoner’s hockey knowledge is essential as is the speed and awareness of Jim Slater during a disadvantage. Peverley understands the defensive aspect and Joey Crabb’s passion will come in handy. Armstrong’s courage to take the hit for purposes of the play make him a strong candidate. Defensemen like Hainsey and Enstrom who were featured on the penalty-kill last season have more PK time coming their way. The reason for this is the exits of Niclas Havelid, Colin Stuart, Eric Perrin and Exelby; four of Atlanta’s better killers. Absolutely huge losses, but there are young defensemen ready to accept new challenges and forwards eager for a chance. If that’s to work, Lehtonen must be sharp for the sake of a decent penalty-killing team. The Thrashers had an 11-6 record in matches which went past 60 minutes last season, a 15-8 mark the year before and 14 wins prior to that. Clearly, these guys don’t mind working overtime (pun intended). Five minutes of 4-on-4 is a toss-up deciding the victor but the shootouts are where Atlanta can really steal points. Kozlov’s incredible 24 for 40 (57.5 per cent) success rate is enough to explain why he routinely shoots first. From there, it gets pretty sour in terms of reputation. Even Kovalchuk doesn’t find the back of the net very often. However, a secret weapon lies between the pipes for Waddell. Hedberg allowed one goal on 13 shots (.923 save percentage) in being a perfect 3-0. The Moose owns a lifetime .820 save percentage stopping 50 of 61 shots in addition to a .800 winning percentage winning 12 of 15. No goaltender who has participated in more than five shootouts can say he’s been finer. John Anderson seems to have the pieces in place and putting them together will be his job. A year of experience behind the Thrashers bench should have improved his comfort. In his coaching with the AHL’s Chicago Wolves, Anderson became the team’s all-time leader in coaching victories both for the regular season and playoffs. On four occasions the team was crowned league champions under his guidance. Asking Anderson to propel Atlanta into the postseason in his second year as head coach may be absurd. We’ve seen strangers things happen and he has the ability to be a great boss as proven by his time with the Wolves.